An online magazine for people passionate about natural and holistic living in southern Spain. Published in English and Spanish. We cover ecology, natural health, environmental issues, alternative energy, natural and organic food, complementary therapies, eco-building and information on all aspects of natural, holistic and sustainable living in Andalucía. Includes a comprehensive Events Guide (here) to what’s on for events throughout the Costa del Sol, with an emphasis on mind, body & spirit as well as live music and festivals. Contains The ‘Green Business Directory’ (here): an A-Z of products and businesses, complementary therapists, centres, classes, courses and workshops. Deluxe listing in our online resource directory that includes name, address, phone number and email, photo/logo, website link, a full page of information about the business / service offered (up to 250 words) priority listing on the site, banner advertising in your category. Unlimited categories. 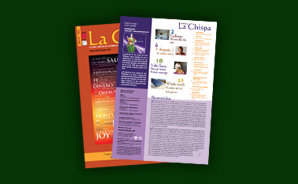 La Chispa can help design adverts. Please phone for details.